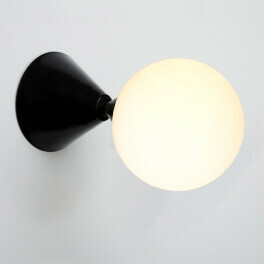 The Periscope Ball light consists of a hand spun, powder coated metal and a brass joint. It's a simple yet sophisticated light that adds coziness to your living room in no time. Atelier Areti is founded by the sisters Gwendolyn and Guillane Kerschbaumer. They imagine how a light exists in a space, how the context is. You can see there is a strong sculptural aspect to their designs. The length of this lamp can be customized. Please contact us for more info. Brass joint can be fixed under the ceiling rose or above the shade. Clouds is the exclusive distributor of Atelier Areti in Belgium. You can order their entire collection.